The methods of preparation used in Bulgarian cooking are not quite different from those used worldwide. You should try Bulgarian cuisine, for there are characteristic features which lend a specific taste and flavour to the dishes - namely those which have helped to make it popular far beyond the country's borders. Bulgarian cuisine skillfully combines the 'fruits of the earth' which have captured the Bulgarian sun. The thermal processing of products simmered slowly on low heat enables their nutritive qualities to be retained and makes the food taste much better. The result is: mouthwatering dishes with SUPERB FLAVOUR & TASTE. As for methods of preparation, for ages Bulgarians have favoured stewing, roasting, boiling, and... the earthenware dish. The roasting of food on charcoal embers is also widespread, leaving the meat deliciously tender and succulent. Bulgarian culinary is influenced both by the diversity of Bulgarian nature and the clearly distinguished FOUR SEASONS. The vegetables, fruits and spices are spread around the different seasons and are to be consumed fresh. In a similar manner, the use of meat also depends upon the season - lamb is more common in spring, light meat like chicken, veal and vegetarian meals are prevalent in summer. Pork meat prevails in winter. Fresh fish is consumed during the entire year. Bulgarian culinary differs in geographical regions and abounds in delicious specialties and exotic dishes: Bansko-style kapama (meat and vegetables stewed in an earthenware dish), Rhodope cheverme (lamb roasted on a spit over an open fire), Thracian katmi (special type of pancake), Dobroudjanska banitsa (cheese pie), Danube fish soup and Sozopol-style mussels. 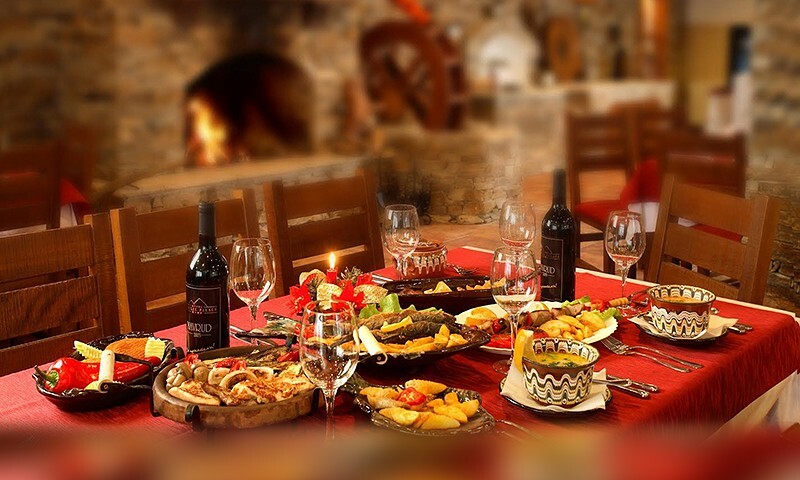 The cozy, typically Bulgarian folk-style restaurants will tempt you with Bulgarian style BBQ and wine, Shopska salad and chilled grape brandy, stuffed vine leaves or peppers, kavarma the miller's way, monastery-style hotchpotch, moussaka and kebab. 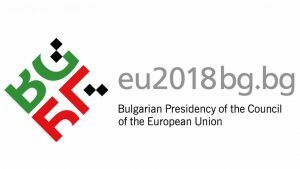 You can't say 'no' to the delicious Bulgarian soups, juicy-grilled meat and kebabcheta, piquant kavarma baked in an earthenware dish, delicious vegetarian dishes, the banitsa which simply melts in your mouth and the famous Bulgarian kiselo mlyako (yoghurt). The smell of oven-fresh bread rolls is mixed with the fragrance of savory. Thinly sliced loukanka (flat dry sausage) from Smyadovo, pastarma, white and yellow cheese are temptingly arranged on ceramic plates..
SIRENE - brined white cheese, produced from sheep, cow or buffalo milk, and is both used on the table and as an essential part of other foods - from Shopska salad to Banitsa. KISELO MLYAKO - sour milk (yoghurt), produced also from sheep, cow or buffalo milk, is a particular variety produced by the Lactobacterium Bulgaricum bacteria and grows no place else in the world. It has found an important part in many Bulgarian foods. Bulgarians are also fond of AYRIAN - a beverage of water mixed with yoghurt. Bulgarians eat yoghurt in some form practically every day throughout their life. CHUBRITSA - the plant, which botanists claim to be a species of the herb Satureia hortensis, appears to grow particularly well upon Bulgarian soil. It also shares certain characteristics with Oregano (Origanum vulgare). The dried leaves are crushed and sprinkled on top of soups in the last few minutes of cooking. The dried leaves can also be grounded into a fine powder, mixed with salt, red and black pepper and used sprinkled on bread. A part of the identity of Bulgarian cuisine is the art of wine-making because GOOD FOOD goes down well with CHOICE BEVERAGES. The white wines - dry and sweet - are characterised by a tingling taste and a delicate aroma. Well-known labels include Misket, Traminer, Dimyat and Riesling. 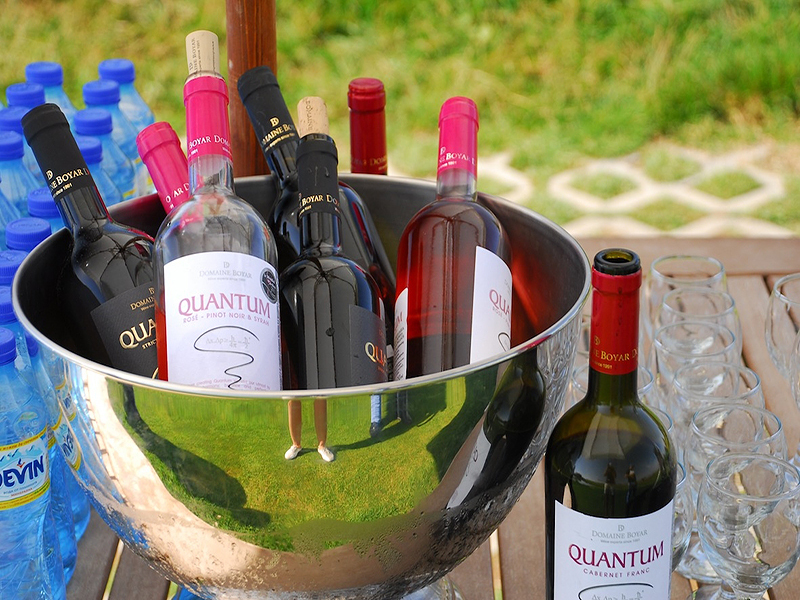 The red wines - from pink to dark red are full-bodied with a bouquet acquired in the process of maturing. The most popular red wines include Mavrud, Gamza, Merlot and Cabernet. Aperitifs occupy a special place among Bulgarian drinks. The typical national drink (rakia) is a fiery brandy ritually consumed with a variety of appetizers (meze). It's worth to try the "hot" plumb brandy from Troyan and the mellow aged grape brandy from Soungurlare. And, finally, a cup of steaming coffee served with sweet jam, pancakes with honey and walnuts or baklava. Desserts tend to be overly sweet pastries and cream-filled cakes, but crepe-like pancakes (palachinki) filled with figs (smokini) are a good alternative. The temptations are many, the choice is yours! GOOD APPETITE! SHOPSKA SALAD - a tasty salad made of tomatoes, cucumbers, onions, and occasionally roasted peppers, topped by sirene (white brined sheep cheese). BANITSA - thin sheets of dough spread alternately with mixture of eggs and white brined cheese (sometimes leeks or spinach), and butter. KAPAMA - stew prepared in earthenware dish, containing meat, game, chicken and pickled cabbage. KEBAB - stew made of meat cut into small pieces. KEBABCHE - minced meat with seasonings, formed into rolls and grilled. MOUSSAKA - dish made of minced meat, potatoes and vegetables. SURMI - mixture of rice and seasoning, or minced meat and seasonings, rolled in cabbage leaves or in vine leaves. On our guided Bulgarian cuisine tours you will get in touch with many new and unique temptations. Dishes are savory and spicy, rich in variety and from different parts of the country. The Bulgarian-grown fruits and vegetables have a specific taste and flavor. Wines make an excellent addition to the food. The choice is such that will really satisfy any taste. We would recommend you to extend your culinary tour and taste some of the most famous dishes and drinks in Romania or Macedonia. We would be glad to assist you in customizing the itinerary according to your preferences. The ideas listed below are just a few samples of the different types of Bulgarian Cuisine tours we can arrange. We can create a tour based on your specific interests enriched by inspiring visits and amazing travel experience. 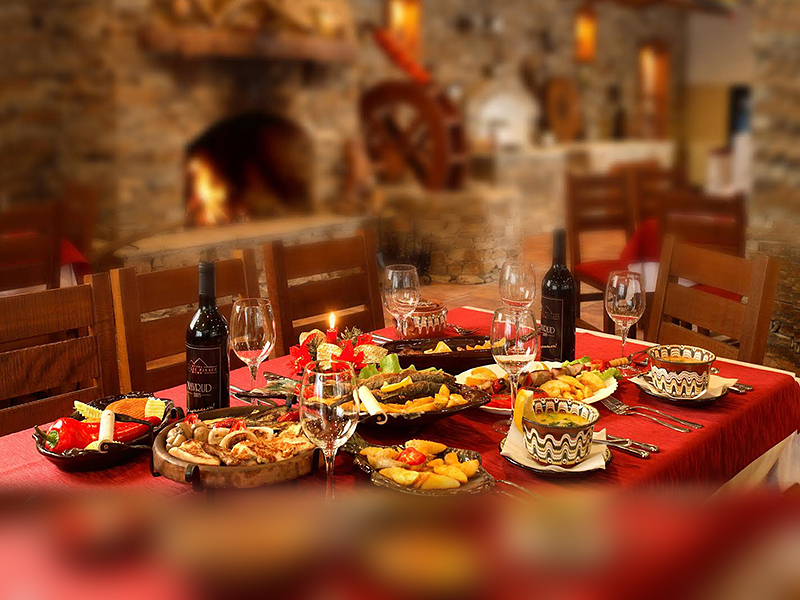 Our guided culinary tour will tempt you with delicious food and wine in selected and renowned traditional restaurants, as well as modern and fancy restaurants in Bulgaria. You will be amazed by the Bulgarian hospitality and coziness of the small and picturesque towns and villages along the itinerary. The famous historical places, cultural sites and beautiful scenery will nicely surprise you. Our guaranteed departure tours Bulgarian cuisine are private guided tours upon request, organized for min 2 persons. The best period is April – October but mostly March and November are also very good for touring in Bulgaria. Special discounts apply for small groups of 6 and more persons. The price includes land services only. It may vary depending on the type of hotel accommodation, transportation and guide service. Our customized Bulgarian cuisine tours variety could be unlimited. Put your ideas in the hands of our travel consultants and they will make your customized tour exclusive and memorable. 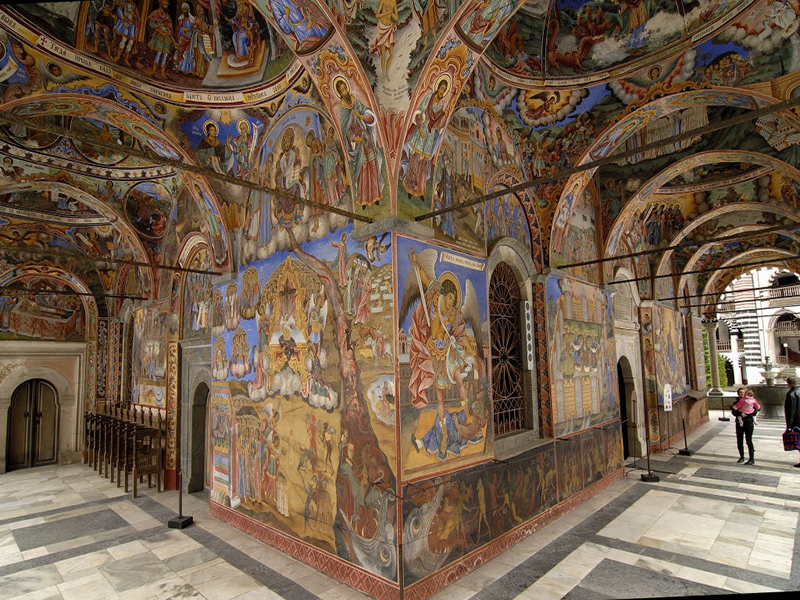 We will design your tour by focusing on your preferred areas in Bulgaria, your interests in the culinary and wine. We will add visits of cultural and historical sites, nature, music, traditions, art and architecture. We would be glad to assist you and be at your disposal by the end of your tour taking care for all details. Feel free to contact us and find out what we can do for your GOOD APPETITE.